A lawyer told me recently that you don’t have any expectation of privacy in public or on a public road. Interesting. While this may be true in a legal sense, we Americans don’t expect to be tracked or scanned BY THE GOVERNMENT wherever we go! We don't expect to be followed electronically. In reality, people think they have a right to privacy, even in the herd. Cameras are popping up everywhere, pointed in your car window, and these are being paid for by YOU through a little known program called the Intelligent Transportation System (ITS). Originally conceived by MIT to improve highway efficiency and safety, since 9/11 it has turned into a government spy program(1) with ever increasing capabilities. If that weren’t enough, cars are being fitted with their own tracking systems in the form of ON STAR etc. and your new cell phone is equipped with e911 capability to track your movements. If you are not sufficiently paranoid or alarmed by the federal no-privacy grab, I suggest reading 1984 and watching movies like “Enemy of the State.” Then, tell your congress-critter you don’t want the government tracking citizens. Then, elect me in November. New technologies are being developed to do electronic strip searches. (1more) The picture below is an airport backscatter camera. In fact there are four technologies which can be used with various resolutions to do this: infrared (IR), millimeter wave (mm wave), backscatter x-ray, and a new technology called Ultra Wide Band (UWB). Newer state of the art cameras are a composition of visible light picture and various other wavelengths superimposed on each other. While the latter (UWB) has low resolution, they are already being deployed in Houston at the fire stations to see through walls. Will the police "borrow them?" 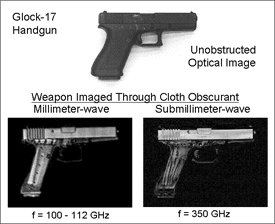 The problem is that the courts have already ruled that the low resolution infrared cameras couldn't be used without a warrant, and the newer technologies have yet to be challenged. Nevertheless, these thru-the-wall cameras are being marketed to police. Fine, just GET A WARRANT! Early versions of the mm-wave cameras were said to be used at the airport instead of the the strip search, but a new news report indicated that they may be used on everyone as they enter the secure zone. I wrote my opponent about this months ago and have yet to get a reply. After all, their general use on the public would cause a Libertarian outcry. Prior to September 11, 2001, intelligent transportation system’s applications were thought to be limited in helping relieve congestion and improving safety. Now, applications that were primarily used in military applications, are finding a more broad, homeland security function. Most of ITS applications fall within three categories: detection/prevention, response and evacuation. Originally, detection technologies were most commonly used in tracking vehicles to better manage fleet inventory shipping schedules. Now, these same technologies are being used with security in mind. Automated vehicle location (AVL) technologies can track cargo delivery and display the location of a hazardous shipment. Closedcircuit television cameras and sensors now are used to monitor critical infrastructure (bridges, tunnels, freeways). On the response side, traffic management centers can become emergency command centers in the case of a terrorist attack or natural disasters. For example, after the pentagon was attacked on September 11th, the traffic management center in Arlington quarantined roads around the Pentagon, reversed HOV lane direction on I-395, and optimized traffic signal timings to allow for a more orderly evacuation of the area. In addition, the traffic management center was able to coordinate communications with police, fire, rescue, and military. This is possible because the same embedded fiber optic communications lines that are part of an ITS system provide a hardened and redundant form of emergency communication. Evacuation of metropolitan areas can be facilitated by traveler information systems. The information that traffic managers collect regarding road or bridge closures, traffic flows, and effective evacuation routes can be communicated directly to drivers on electronic message signs, through radio broadcasts, or via 511 (the universal traveler information number). In the near future, telematics service providers (like ONSTAR or ATX) will be able to send “reverse 911” messages directly into a driver's car. Not only will this technology aid in security capabilities, but also, safety applications will aid in evacuations during natural disasters.